to be the spiritual leaders of Gratia Plena. St. Dymphna (also spelled ”Dympna” or “Dimpna”) was the daughter of a pagan Irish king and his Christian wife in the seventh century. She is honored by the Church as a virgin and martyr. The story of St. Dymphna was first recorded in the 13th century by a canon of the Church of St. Aubert at Cambrai, who was commissioned by Bishop Guy of Cambrai. The canon expressly states that his writings were based upon a longstanding oral tradition and a persuasive history of inexplicable and miraculous healings of those suffering from mental illness. According to the legend, Dymphna, because her father the king was pagan, was secretly baptized and became a Christian through the work of her mother. When Dymphna was 14 years old, her mother died. Because his wife was of extraordinary beauty, the king sought to find a new wife who looked exactly like her. The king, unable to satisfy his fantasy then decided to marry Dymphna, his own daughter, because she was beautiful like her mother. To avoid this, Dymphna fled with a priest Fr. Gerebernus to Gheel, Belgium. Some messengers of her father later discovered them there. So her father the king went to Gheel and expressed his intent again to marry his daughter and take her home. When Dymphna and Gerebernus protested and resisted, he commanded his servants to slay the priest, while the king himself struck off the head of his daughter. After Dymphna and Gerebernus were murdered, the residents of Gheel buried them in a nearby cave. Years later, they decided to move the remains to a more suitable location. According to tradition, when the workmen entered the cave to retrieve the two bodies, they found that the bones of Dymphna and Gerebernus had been miraculously interred in two stone sarcophagi, one of which bore a red tile with the inscription "DYMPNA." The remains of Saint Dymphna were later put into a silver reliquary and placed in the Gheel church named in her honor. The remains of Saint Gerebernus were moved to Xanten, Germany. From time immemorial, the saint was invoked as patroness against mental afflictions. There are published numerous accounts of miraculous cures, especially between 1604 and 1668. As a result, there has long been a colony for those with mental illness at Gheel. In recent years there have been sometimes as many as fifteen hundred there. They are treated with special care and concern. In the beginning they are placed in an institution for observation, but later they are given shelter in the homes of the inhabitants, take part in agricultural work, and are treated very kindly. This form of community treatment seems to produce good results. The old church of St. Dymphna in Gheel was destroyed by fire in 1489. The new church was consecrated in 1532 and is still standing. Every year on the feast of the saint (May 15), numerous pilgrims visit her shrine. 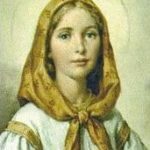 Lord our God, you graciously chose St. Dymphna as patroness of those afflicted with mental and nervous disorders. She is thus an inspiration and a symbol of charity to the thousands who ask her intercession. Please grant, Lord, through the prayers of this pure youthful martyr, relief and consolation to all suffering such trials, and especially those for whom pray: (here mention those for whom you wish to pray). 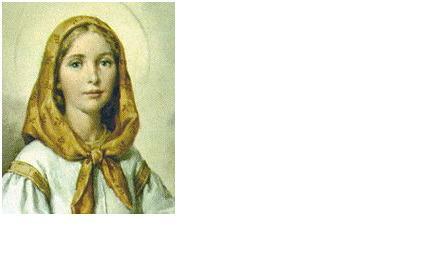 We beg you, Lord, to hear the prayers of St. Dymphna on our behalf. Grant all those for whom we pray patience in their sufferings and resignation to your divine will. Please fill them with hope, and grant them the relief and cure they so much desire. We ask this through Christ our Lord who suffered agony in the garden. Amen.